No word captures that July feeling better than “independence” (“The heat index is what?” is technically five words). So, it’s only fitting that this month we’re rolling out new QuickBooks® features that give you and your clients more freedom to work exactly how you want. In a nutshell: Adding apps for your clients is crucial to simplifying their business, but it shouldn’t complicate yours. 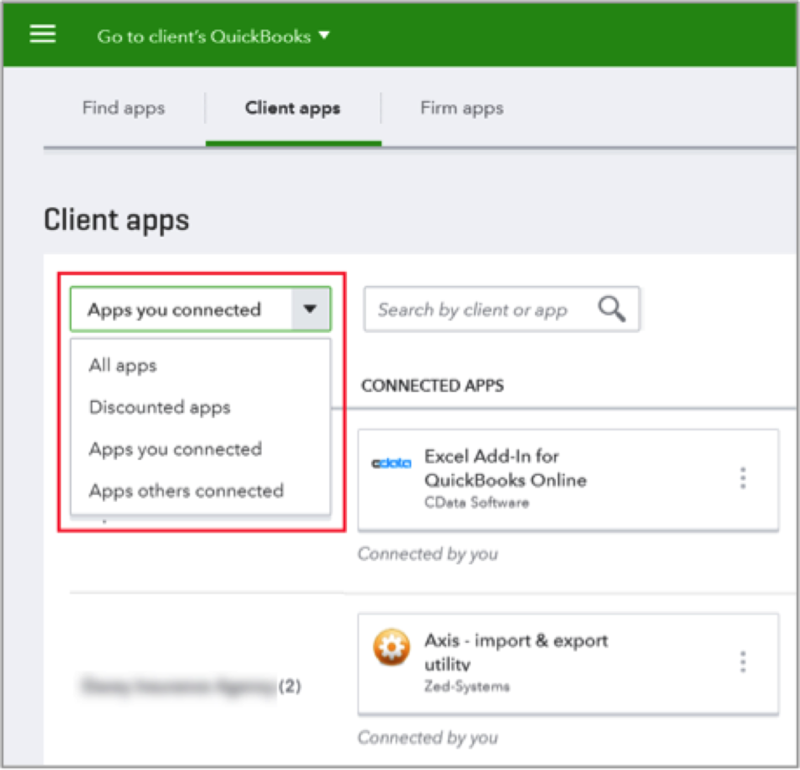 We’ve redesigned the Client apps dashboard in QuickBooks Online Accountant so you can view and manage the apps your clients use with a couple clicks. What’s changed: You no longer have to search clients individually to see which apps they’ve installed or to make changes. 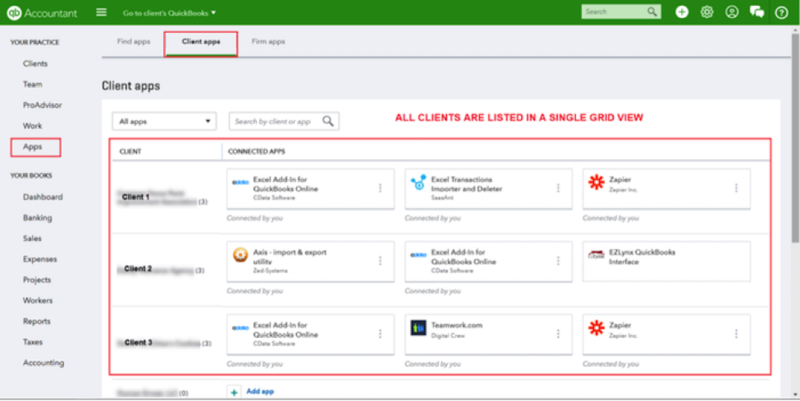 The Client apps tab provides a birds-eye view of all the apps connected to your clients. You can complete actions right from the main dashboard—such as activating or deleting apps—and quickly find information by filtering search results. We’ve also listed the app developers’ contact info so you can reach them directly if you need support. With our new notification system, we’ve made sure your clients will get the message loud and clear whenever e-invoices don’t go through; clients never have to worry about failing to get paid. How it works: If your clients’ e-invoices bounce or fail to send, they’ll immediately receive an email from us letting them know what happened and how they can resend the message. Updated status within the invoices list. Explanation within the invoice tracker. Support steps under the Needs Attention filter of the invoice list. In-line explanation within the email modal. Community help articles with step-by-step instructions on resending. In a nutshell: Advising clients on QuickBooks Online can be tricky when you’re just getting started on the cloud. Well give yourself a little credit—no, literally. Now you can earn CPE credits when you complete various trainings within QuickBooks Online Accountant. That way, you can build steam toward certification while developing the unique skills you need to delight QuickBooks Online clients. In other words: One stone, meet two birds. How it works: No mystery here. Just complete the training, followed by a CPE assessment, and you’ll pocket a nice handful of CPE credits to go with your newfound QuickBooks Online knowledge. In a nutshell: Your Schedule C clients’ invoices should convey their unique personality, not just ours. We’ve revamped the invoicing experience in QuickBooks Self-Employed, giving your clients the freedom to leave a personalized impression with customers while also growing more efficient and organized. Customize the subject line and main message of the invoice email. Duplicate prior invoices they want to create again, eliminating manual busy-work. Send receipts for paid invoices to give customers transparency. Send a mobile reminder to customers before payment is due, reducing payday anxiety. In a nutshell: You’re always there for your Schedule C clients, but it never hurts to have backup. Enter the QB Assistant, our virtual aide housed within the QuickBooks Self-Employed app. With the touch of a button, your Schedule C clients can get on-demand product help, insights, and a well-deserved dose of confidence—and you get the freedom to focus on the big picture. How it works: After opening the QuickBooks Self-Employed app, your clients should select the green message icon. This will open the QB Assistant chat screen, where they can interact with their helpful new bot through text or voice commands. Check out the animation below to get a sense for how QB Assistant can help your clients stay organized and get instant clarity around their finances. And in case your clients need more help, they just need to say, “I need help from a human” and QB Assistant will connect them to live support. In a nutshell: Tax time is exhausting, and once it’s done—coffeepot poured out, receipts pored over—your Schedule C clients don’t want to fuss with their records one second longer than necessary. With our new bulk receipt exporting, they won’t have to. How it works: Your clients no longer need to export receipts individually to file them away in their records. They can now run a report right in QuickBooks Self-Employed that downloads all of their digitized receipts at once. This lets them periodically unclutter their books and maximize organization with minimum effort. In a nutshell: These have been the two most-requested new reports, and we’re thrilled to announce they’re here! 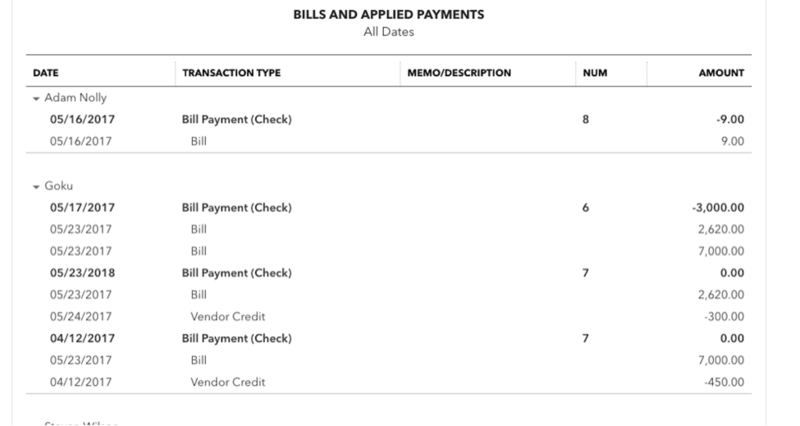 You and your clients can now run reports to easily show vendors and customers which bills and invoices correspond to which payments, and quickly settle any disputes. 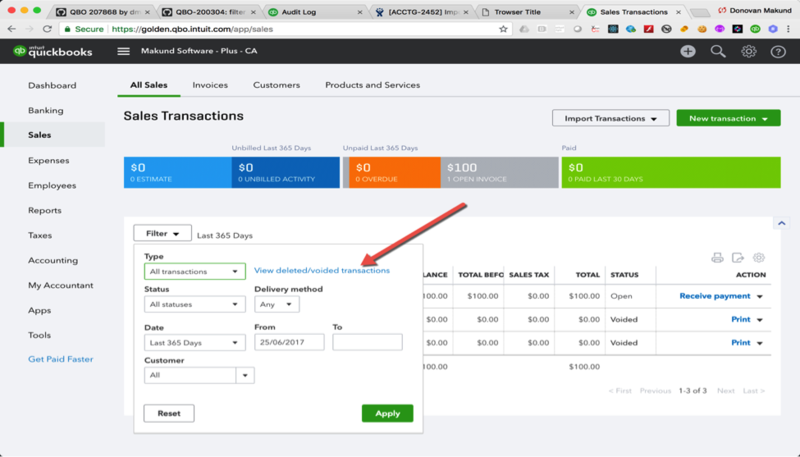 How it works: You and your clients no longer need to cobble together payment trails using the transaction list in QuickBooks Online. Now you can simply head into the Reports tab and run reports that clearly associate payments with the bills and invoices they cover, eliminating guesswork. Improved! Faster invoice actions: If you or your clients need to delete, void, or copy invoices or sales receipts, you can now find these options in the Action column of your All sales list. Improved! Quick link to your transaction audit trail: Select our new link within the All sales filter to easily find deleted or voided transactions—no more losing time running reports. Improved! 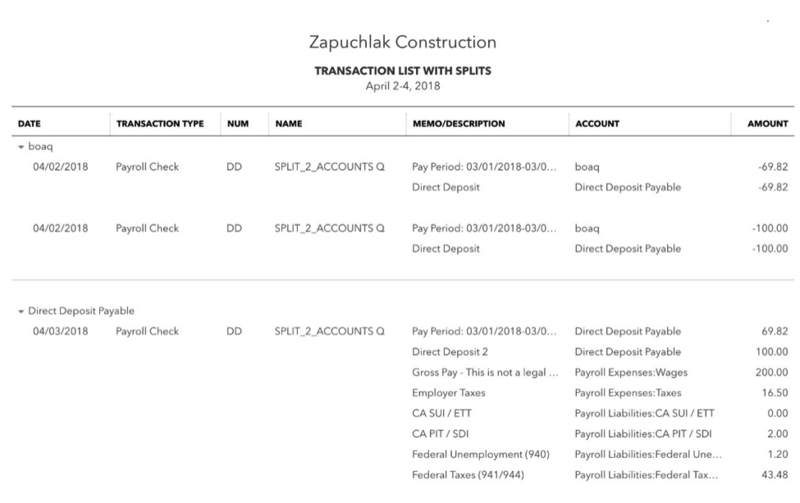 Reconcile paychecks deposited in two accounts: Paychecks deposited in two bank accounts will now show up as two distinct transactions in QuickBooks Online, not one, so they’re easier to match when it’s time to reconcile. Improved! 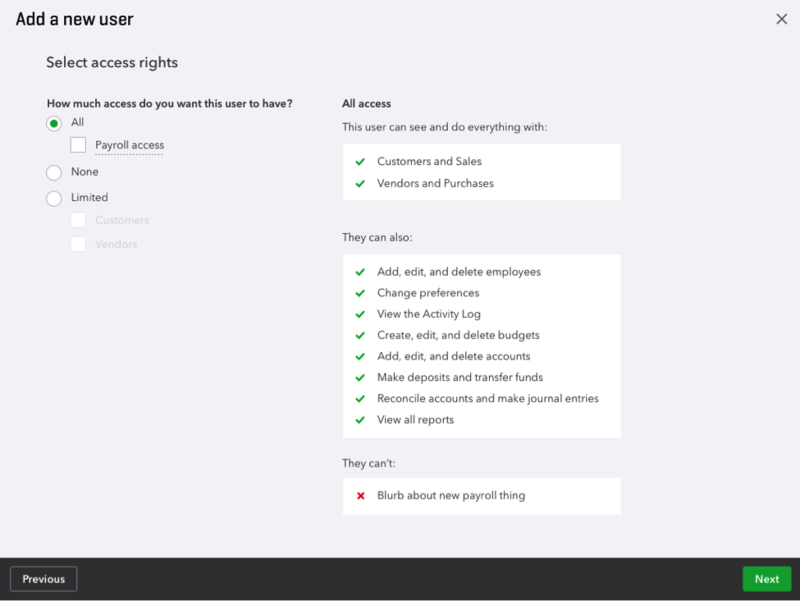 Let users access everything but Payroll: When adding new users to a QuickBooks Online account, you and your clients can now assign a no-payroll permission—protecting your financial security without otherwise limiting the user’s freedom. That’s all for now, folks. Until next time, as always, keep your feet on the ground … and your books in the cloud.